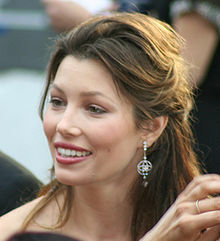 Jessica Biel at the 81st Academy Awards in 2009. Jessica Claire Biel is an American actress and former model, who has appeared in several Hollywood films, including Summer Catch, the remake of The Texas Chainsaw Massacre, The Illusionist and I Now Pronounce You Chuck and Larry. She is also known for her television role as Mary Camden in the long-running family-drama series 7th Heaven.